Key to this year’s ETC stand is the company’s newest and most innovative LED lighting fixtures – the Source Four LED CYC and the Desire D22. The CYC is an accessory which can be attached to any Source Four LED fixture engine, producing the powerful beam that the Source Four family is known for. It means that the fixtures can be used as profiles when they’re not needed as cyc lighting – saving on additional inventory which may not always be needed. The 20cm, three kilogram Desire D22, meanwhile, completes the ETC Selador LED range, and brings efficient wash lighting to theatres, museums, lobbies, retail outlets and other installations where low profile fixtures are a must. It’s the perfect detail light for any professional venue. Despite its size, it has the same quality colour mixing, smooth dimming, intuitive user interface and stand alone operation that the Desire line is known for. The D22 is available with portable, canopy (ceiling mount) and 3-circuit Eutrac Adapter mounting options. Versions offered include Lustr+ for a complete range of colour mixing, and fixed colour temperature white light options in the Daylight and Tungsten and finally the Studio HD for variable colour temperature white light. 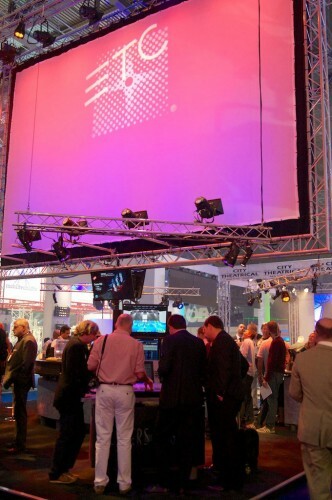 The Cobalt control system was previewed at this summer’s CUE event in the US and is now presented to the public for the first time at PLASA London 2013. “We really wanted users to be able to reach out and touch the light – craft it, colour it, move it,” says Cobalt product manager Sarah Clausen, “with nothing between them and the rig. Thoughts turn into light. That’s what we’ve achieved with the multiple touch screens of Cobalt – users simply touch what they want to change, just like they’re used to with their smartphone or tablet. Ti was first shown in public at ABTT earlier this year, receiving impressive reviews from stand visitors and also from beta testers. Both London’s National Theatre and the Royal Exchange Theatre in Manchester have become early adopters of the console. The seminar times will be announced on the ETC stand. For more information and a demonstration of these and other products from the ETC range of lighting, power and control products, as well as to book a place in the ETC PLASA Lounge, please visit ETC’s PLASA London stand J60 at ExCeL 6-9 October.